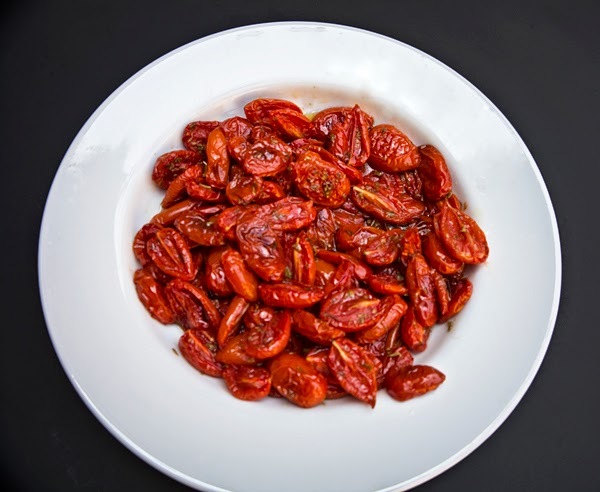 Slice the grape tomatoes in half and place them face up on a baking pan lined with parchment paper. Sprinkle them with salt and oregano and bake them at 180 degrees (350 Fahrenheit) for 45 minutes or until they wrinkle. Pour a bit of olive oil over them, cover, and let them rest. The simplicity of this dish is the essence of what I love about Italian cuisine. Simple ingredients, simple techniques, amazing flavor, and a laid back quality that lends itself to leisurely meal with a good bottle of Italian Red… our favorite is Amarone! Our final dish was Tiramisu, but someone (I’m looking at you, Robert!!!) ate it before I had a chance to photograph it!